Today Castles, Crowns and Cottages is having a PARIS PARTY... I agreed to paint for it... and it has been a PLEASURE... andddddd NOW I can't stop... I'm still painting PARIS... MORE PAINTINGS will be uploaded HERE throughout the DAY... Come back to see them!!!! HAPPY BIRTHDAY to PINK SATURDAY!!! 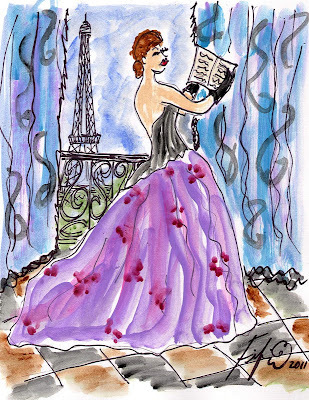 The Paris Balcony HANDPAINTED bookmark can come with PINK or GREEN ribbon... when purchasing TELL WHICH COLOUR YOU PREFER!!! Oui oui oui.... ALL of these paintings are being put up for SALE in MY SHOP... ONE could be YOURS!!! Oui oui oui... the BIG CLEARANCE SALE in My Etsy Shop CONTINUES!!! LOW shipping elsewhere ON PAINTINGS!!! 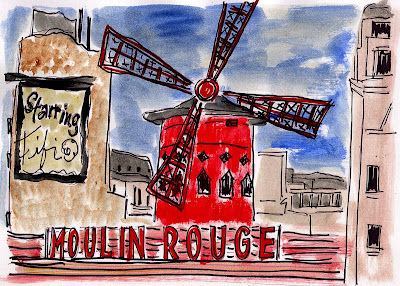 to see more PAINTINGS of PARIS!!! There are GIVEAWAYS and INTERVIEWS and MORE FUN!!! And of course you MUST visit other Blue Monday and Metamorphosis Monday postings!!! 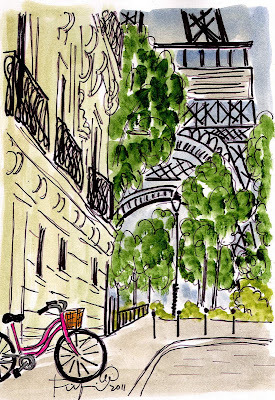 Love your art and Paris paintings make my heart sing! well I think you could probably sell pink bikes to all of the peeps who participate in PS! grins! I know I would buy at least one! maybe even 2 - one to ride around town and one to display on my front porch with seasonal flowers! Fifi I adore being part of Anita's Paris Party!! Love your art $ French Bookmarks, the pink ribbons strike me the most! My post i Finally up without verbiage ...blogger issues! Come visit! ok....I'm so crazy about your artwork!!! I love it. So glad Anita had this Paris party...she's the best!! Now I'm going to comb through your art!! It was great to be able to catch up with you at the Paris Party. All your artwork is fabulous. Your work is always so delightful! I just love it. It evokes the personality of Paris perfectly. Dear Fifi .... you are so talented! Such beautiful art and I love the big picture of the Paris balcony!!!! What a fun time all being in Paris together and your artwork brings it to life! Love the bookmarks-so enjoying mine! 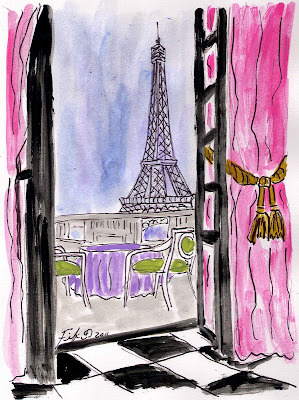 I just love your Paris paintings. They make me want to go back! wow these are simply amazing!! P.S> I will take a new book mark please! Hee Hee! They are so lovely. Love your beautiful bookmark blues. probably not but you know what Im saying right? These are all so gorgeous, darling!